One of my childhood best friends was from Iran, which may explain why I find myself feeling at home in the company of Persians. And for that reason, I have always been interested in visiting the country, but it’s not exactly a top travel destination. Fast-forward many years and I finally get my opportunity as we journey to the land of Shahs to meet my brother's future in-laws! Our families bonded so tightly that I felt more like a relative than a guest or tourist. The hospitality we experienced was overwhelming. Granted, we spent most of our time with our new extended family, but the people in general made such a good impression on me. Already on the flight there, I observed how many of my fellow passengers were calm, polite and good-natured - true ladies and gentlemen. Perhaps this could be one example where the less-than-favorable reputation of a country is more a reflection of the government than its citizens. A good number were beautiful on the outside too. On that note, one interesting fact that I learned is that many if not most Iranian women have nose jobs! In fact, it’s a status symbol, so it’s not unusual to see women (and some men) walking around, eating and socializing with bandages on their faces. Since 1979, women have had to cover up for religious reasons - but another big discovery was that it doesn’t have to come at the expense of fashion! Tops must cover your arms & derriere, so you’ll see stylish wraps & blazers - often paired up with skinny jeans. Also, makeup is huge in this part of the world because it’s a way of enhancing your beauty, since headscarves are required. That being said, many young women really push the envelope by draping the ‘hijab’ so loosely that it’s more off than on, and enforcers seem to turn a blind eye more and more as time passes. Hard, and sad, to believe that about 40 years ago, Tehran felt like Paris… You can still get a taste of this at private gatherings, where the dress restrictions don’t apply, so this is the chance for modern women to get glammed up (at times I felt underdressed!). I’m known for my big appetite, but I don’t think you truly understand the meaning of the word gluttony until you come to a place like Iran, where the philosophy is - your guest’s plate should never be empty. Even if you decline, it’s assumed you’re being polite and your plate will be replenished. It felt like we were eating nonstop - chewing was like breathing. And the dishes are carb heavy. Lots of rice and lots of bread - simultaneously. Not just one but stacks of flat bread, of every variety, each one the size of a pizza pie, are placed on the table for everyone to share. Did the quality of the food match the quantity? My stomach says yes! The streets, sidewalks & shops were remarkably clean and orderly; not even the bazaar was chaotic. On the opposite end of the spectrum, the traffic was some of the worst I’ve ever seen. The fact that it was the Persian New Year (Google date switched to 1396! ), a multi-day holiday, didn’t help matters. 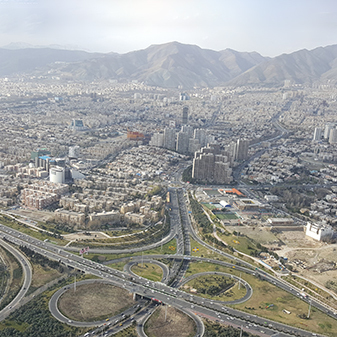 Tehran is huge, with a population of almost 9 million, that you need more than a couple of days to cover even just the urban area (730 sq km). I enjoyed our visit to the National Jewelry Treasury, and the spectacular view from the Milad Tower exceeded my expactations. On our final day, we unfortunately decided to forgo our excursion to the ancient city of Hamedan due to traffic concerns. 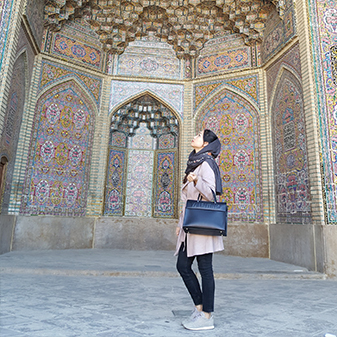 Fortunately, towards the beginning of the trip, we did manage to visit the capital of Old Persia...Shiraz...also known as the city of poets & gardens. 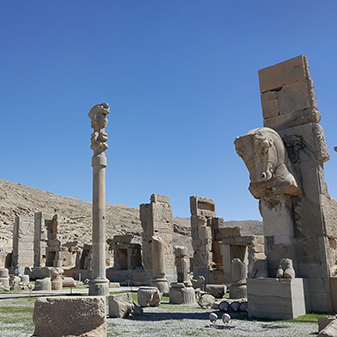 We also visited a few mosques & museums, but the piece de resistance was another 60km away - the ruins of Persepolis (“the palace of the Kings of Kings, burned by Alexander the Great”), with the earliest remains dating as far back as 515 BC. 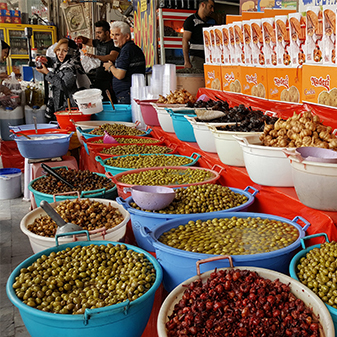 Keeping in mind taste is subjective, the Shiraz sights didn’t move me as much as some other places I’ve visited have; but with Tehran being a fairly modern city, the side trip is worthwhile - it’s a World Heritage Site, after all. 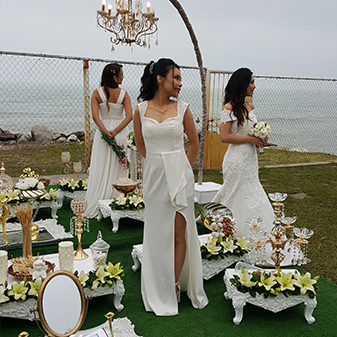 The majority of our time was spent at the family’s seaside villa in Nowshahr, located on the Caspian Sea about 4 hours away from Tehran. When visiting any country, if time permits, I encourage you to journey into the countryside. Discovering the lesser-known areas often ends up being a real eye-opener and highlight. 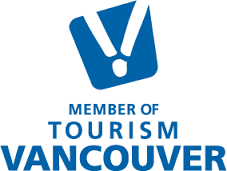 At this point in time, in order for Canadians to be considered for a visa, they must be able to prove that they are joining a tour for the entire duration. While this restriction doesn’t apply to citizens of all countries, I don’t think I would recommend any other way, as English is not spoken by the general public and all the signs are in Farsi. Not to mention there are two currencies (Rial & Toman) to figure out! I didn't realize that there are only a few countries in the world that have the complete four seasons, and Iran is one of them. Depending on where we were, I experienced everything from snowy to summer-like conditions!